Following up on the theme posted in March 2012 this is a guest post from Erin Taylor, New England Aquarium Conservation Department, on the Phoenix Islands Protected Area initiative. 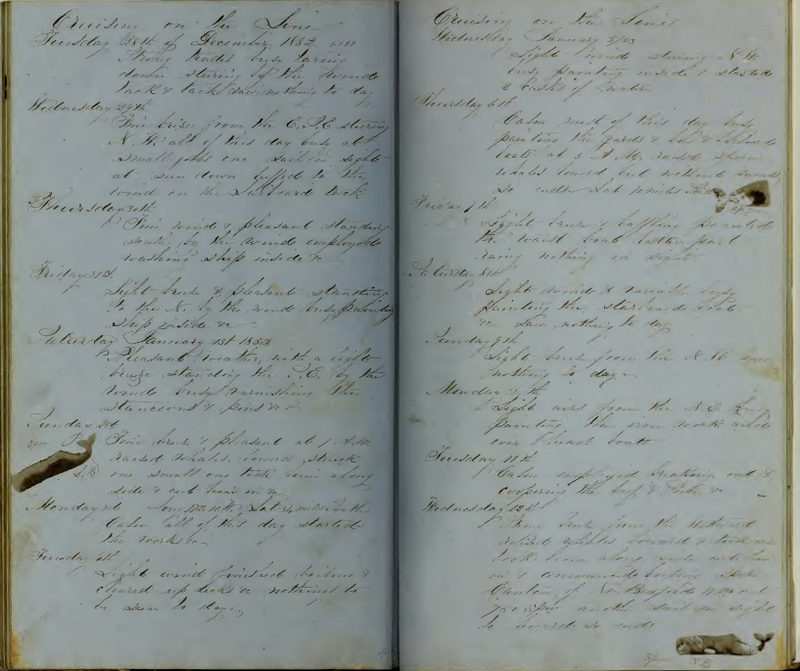 In a series of posts she has been sharing her research on 19th century sperm whaling in the Phoenix Islands. This careful examination of whalers' log books, maps and historic whale distributions may help researchers studying sperm whale populations in Kiribati today. As mentioned in the last post of this series, researchers at the New England Aquarium are in the process of creating maps based on 19th-century whaling logbook data to try to better understand sperm whales in the Phoenix Islands and surrounding region. In the next few posts, we’ll show you what patterns are uncovered when we start to break down the data, highlighting the whales’ distributions from different angles—a task that, inevitably, leads to even further questions. Below, we share one of our maps analyzing whaling by months. Migration patterns for sperm whales are not well understood. Populations in the Pacific Ocean are thought to inhabit the tropics year-round, with family groups of females and young staying in equatorial regions while males migrate to the poles. By taking a look back at how whaling changed throughout the months during the historic whaling era, we can begin to shed more light on sperm whale migrations. The Phoenix Islands and surrounding Pacific Islands were said to be particularly important for whalers during the months of December to March, when schools of sperm whales were supposedly migrating through the area. Our maps generally support this notion, as the months of December to February feature the highest number of voyages of any other time throughout the year (check out the map of these months below). These three months also collectively had the highest number of sperm whales strikes at 91 whales, representing a full third of the total. 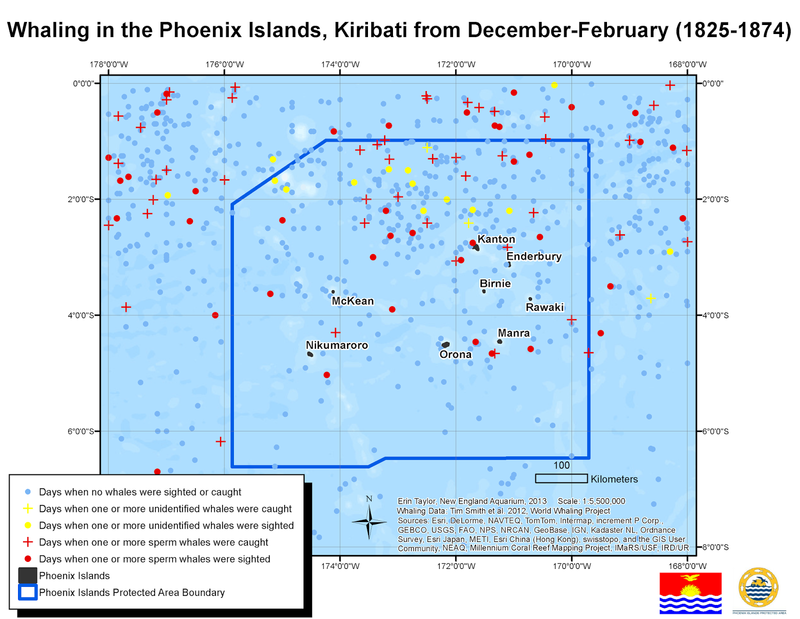 Snapshot of historic whaling in the Phoenix Islands Protected Area when broken down by months; this map shows the months of December to February, representing the time of year with the heaviest whaling activity and highest number of sperm whale kills in this study. Further, whaling activity during December to February was widespread throughout the region. This is in contrast to the activity of June to August, which stays largely clustered near the equator between 0 and 2 degrees S. It is possible that this expansion away from the equator during December to February and contraction towards the equator in June to August could be indicative of yearly whale movements, with the other months representing transitional periods. However, it’s difficult to be sure of the reasons behind these patterns without a better understanding of sperm whales in PIPA, which can be achieved with further study. Keep an eye out for our next post, which will reveal another method of breaking down whaling data: by years!